“It’s hard to imagine buying new clothes, coming home and throwing half of them away, yet that’s what many of us do with our food.” So says Sherri Brooks Vinton in her book, Eat it up! – 150 Recipes to Use Every Bit and Enjoy Every Bite of the Food You Buy. Food waste in the home is just the tip of the iceberg. Produce is wasted in the harvesting, processing, packing, and retail stages as well. Overall, 40% of the food produced in the United States is wasted. 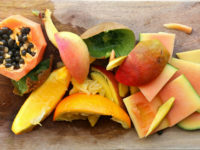 In Eat It Up!, the author reveals how to reduce kitchen waste by using more of the food we buy. She gives tips for each food on how to buy, store, and prepare it, allowing shoppers to get the most out of a food budget. Not only does using all parts of the food purchased save money, it saves time by reducing trips to the market, preserves the natural resources used to produce the previously wasted food, and honors the farmers’ labor in producing the food. Where this book really shines, however, is in providing recipes that allow all that unwasted food to taste great! Ranging from drinks and deserts to full meals, the various recipes are broad in application. Vinton describes the benefits of cooking meat still attached to the bone, allowing bone marrow to add flavor as it cooks, along with how to prepare vitamin- and mineral-rich broths and stocks from meat used in prior meals. She also provides uses for peels and scraps. For example, a celery and radish salad can be prepared from leaves that would have been discarded. Watermelon rind can become curried watermelon, lemon and orange peels can be transformed into citrus and chili dust, and apple peels can be made into apple tea. Eat It Up! highlights numerous ways food waste can be reduced in a tasteful way. From the market to the counter, Vinton provides easy strategies to prevent food waste.